The day scientists have been waiting for has finally arrived. A huge part of the Larsen C Ice Shelf, one of the biggest icebergs ever recorded, has just broken away from Antarctica and is now drifting in the ocean. This section of the ice shelf is roughly 6,000 kilometers square (2,300 miles square) in area – that’s around four times the size of London. The calving of the trillion-tonne iceberg occurred sometime between Monday, July 10 and Wednesday, July 12. It was confirmed this morning through thermal infrared satellite images. Scientists have watched this event slowly unfold for years. Professor Adrian Luckman, lead investigator of Project MIDAS, which has been closely monitoring the situation, stated last month: "If it doesn't go in the next few months, I'll be amazed.” Although his forecast proved to be right on the money, predicting this event has always been tricky. 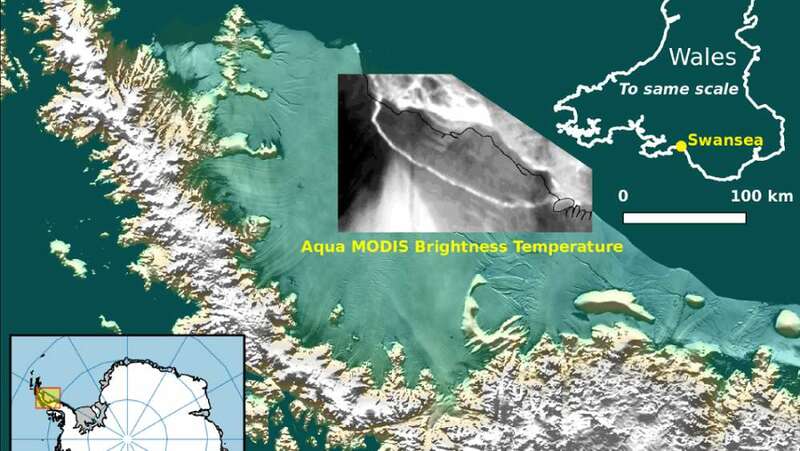 “We have been anticipating this event for months, and have been surprised how long it took for the rift to break through the final few kilometres of ice,” Professor Luckman said in a statement on July 12. “We will continue to monitor both the impact of this calving event on the Larsen C Ice Shelf, and the fate of this huge iceberg." The crack has been growing dramatically since 2010, lengthening to more than 200 kilometers (120 miles) in the following seven years. It grew in spurts due to the changing density of the ice it passed through. Softer ice took longer to crack, whereas it propagated much quicker through harder ice. It also continuously formed new branches in the crack, with a major branch earlier in 2017 eventually leading to this split. The Larsen Ice Shelf is actually a series of shelves that’s been breaking up since the 1990s. The Larsen A ice shelf broke off in 1995 and there was also the sudden break-up of the Larsen B shelf in 2002. Although many scientists believed that climate change has made the cracks grow quicker, the event is best described as a geographical event rather than a climate event. “The iceberg is one of the largest recorded and its future progress is difficult to predict. It may remain in one piece but is more likely to break into fragments. Some of the ice may remain in the area for decades, while parts of the iceberg may drift north into warmer waters.